Version 8.5 of VintaSoft Imaging .NET SDK has been released. JBIG2, JPEG2000, Document Cleanup, OCR, DICOM, and Forms Processing Plug-ins. Created the platform-independent web services. This allows to use Vintasoft web services on any .NET web platform, i.e. ASP.NET WebForms, ASP.NET MVC, ServiceStack, etc. ASP.NET MVC 5 and jQuery v2-v3 supported. The detailed information can be found here: https://www.vintasoft.com/vsimaging-dotnet-history.html. 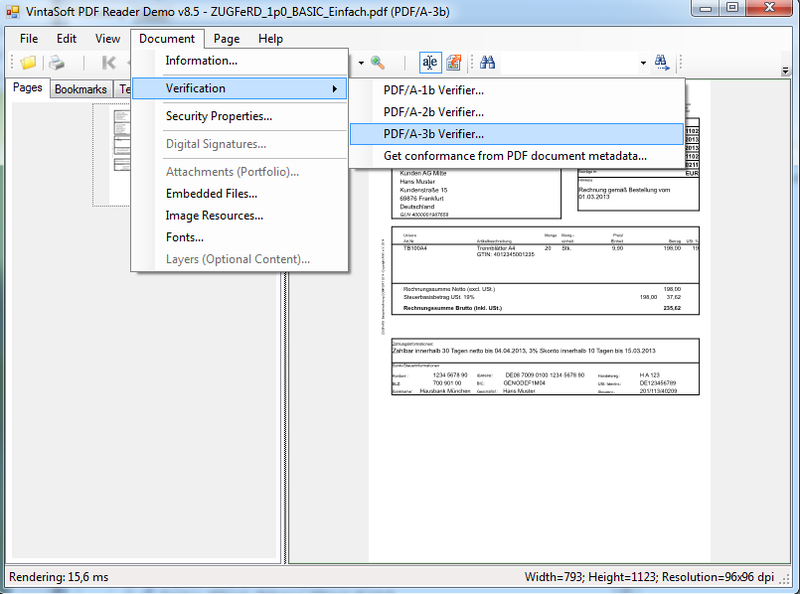 Added the ability to verify PDF documents for compliance with standards: PDF/A-1b, PDF/A-2b, PDF/A-3b. Added the ability to convert PDF document into following formats: PDF/A-1b, PDF/A-2b, PDF/A-3b. Added the ability to work with PDF document in multiple threads (rendering, getting thumbnails, text extraction, image extraction). New types of PDF annotations supported: Ink, File Attachment. Added the Cloudy style for the following PDF annotations: polygon, rectangle, free text. Now PdfDocument class by default uses a controller of external fonts with fallback-font, i.e. any not found font will be replaced by default font. New features added to PDF Reader Demo, PDF Editor Demo and PDF Structure Editor Demo. The detailed information can be found here: https://www.vintasoft.com/vspdf-dotnet-history.html. The used Tesseract OCR engine has been updated to version 3.04. Added the ability to use the Tesseract OCR engine in multithreaded environment. Improved the quality of text recognition in color images. Reduced the peak memory usage allocated during recognition of text in color images. The detailed information can be found here: https://www.vintasoft.com/vsocr-dotnet-history.html. Added the ability to set the style to Cloud or Triangle for the following annotation types: Lines, Polygon, Rulers, Angle, Triangle. The detailed information can be found here: https://www.vintasoft.com/vsannotation- ... story.html. 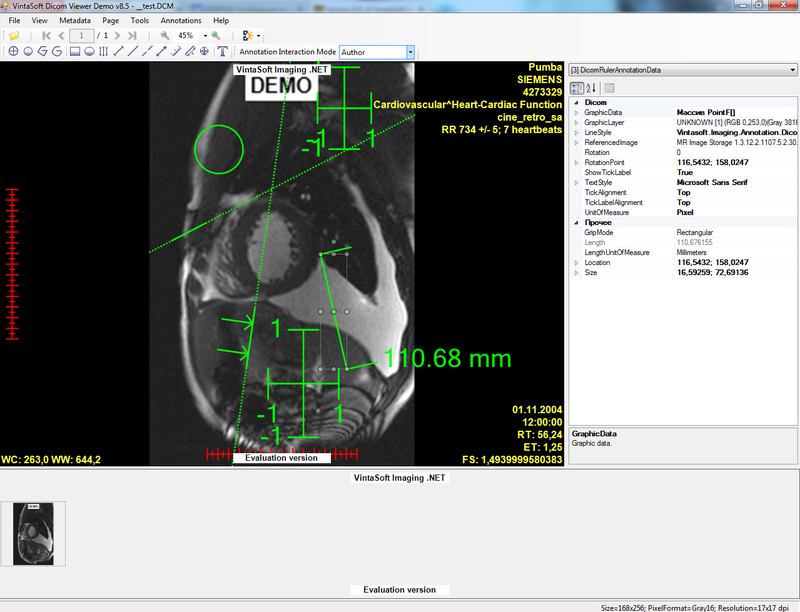 Added the support for the following DICOM annotations: Circle, Infinitiline, Cutline, Ruler, Axis, Crosshair. New features added to Dicom Viewer Demo. The detailed information can be found here: https://www.vintasoft.com/vsdicom-dotnet-history.html. Created the processing command LineRecognitionCommand, which allows to perform the search of lines on the image. Created the processing command LineFillingCommand, which allows to fill lines in the image. The commands for removing and filling lines have been extended with ability to find the lines with breaks. The detailed information can be found here: https://www.vintasoft.com/vsdoccleanup- ... story.html. Version 8.5.1.1 of VintaSoft Imaging .NET SDK has been released. Fixed minor bug in JPEG encoder. Fixed minor bug in GIF encoder. 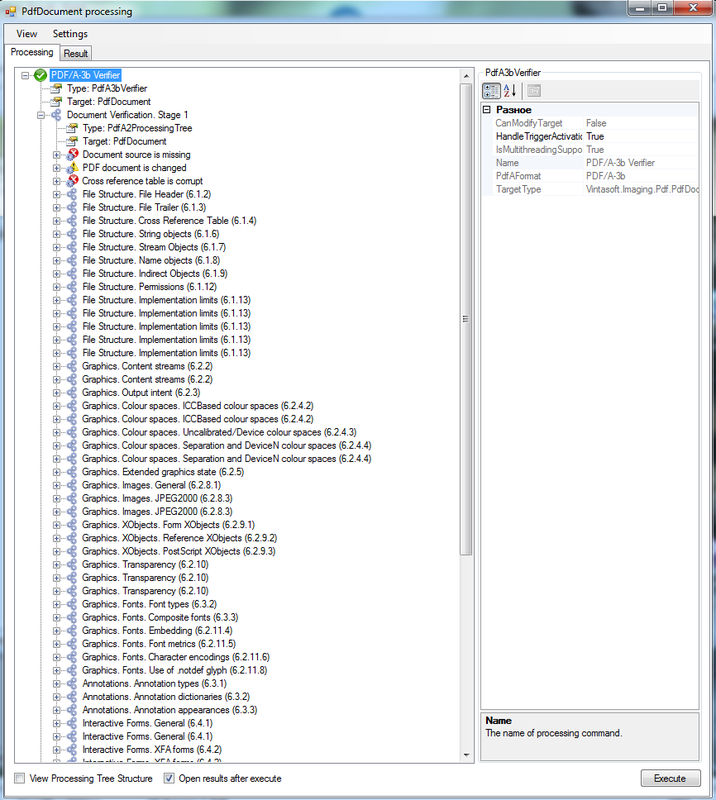 Fixed minor bug in VintasoftImage.LoadingError and VintasoftImage.LoadingErrorString properties. In PdfTextSelectionTool class fixed the bug in reverse text search algorithm. Fixed minor bug in PDF/A verifier. Improved the selection of PDF annotations, which have the Cloud border style. Now Line, Lines and Polygon annotations support the color blending in WinForms and WPF. Now WANG annotations can be drawn highlighted. Valid only for lines, rectangles, and freehand. 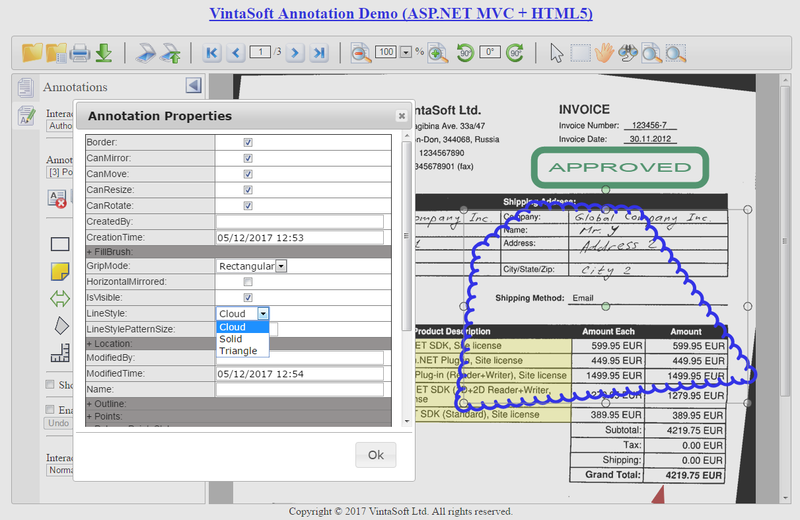 Improved compatibility with Vintasoft annotations version 2.0 and earlier. Fixed minor bug in text recognition algorithm. 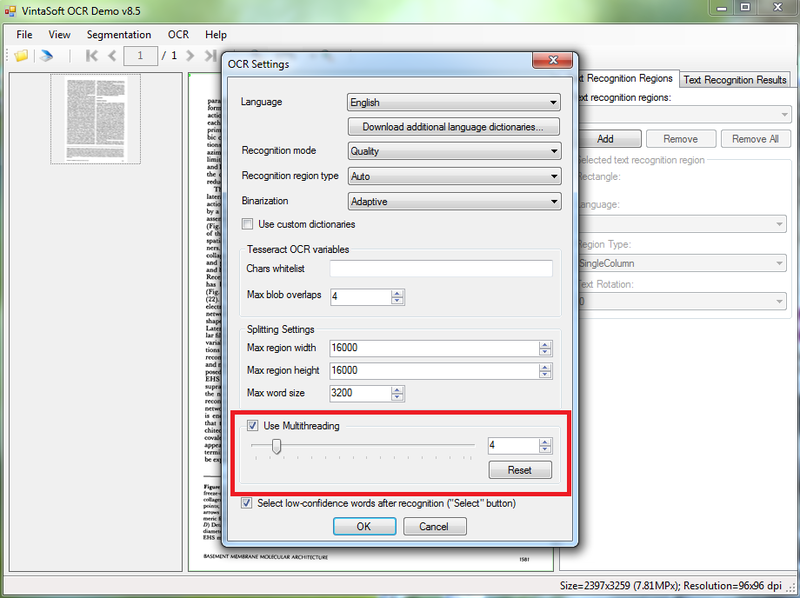 Now OCR Demo allows to change the setting for multithreaded text recognition. Version 8.5.2.1 of VintaSoft Imaging .NET SDK has been released. 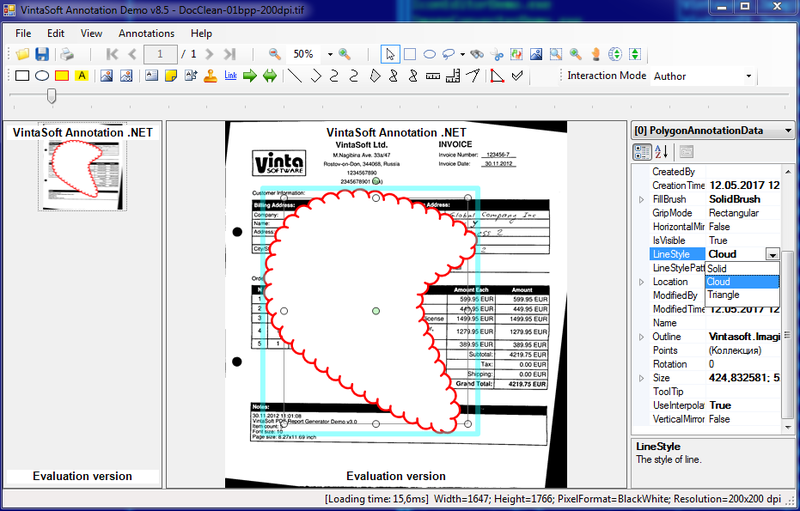 Fixed the bug in algorithm that removes vector content from PDF document. 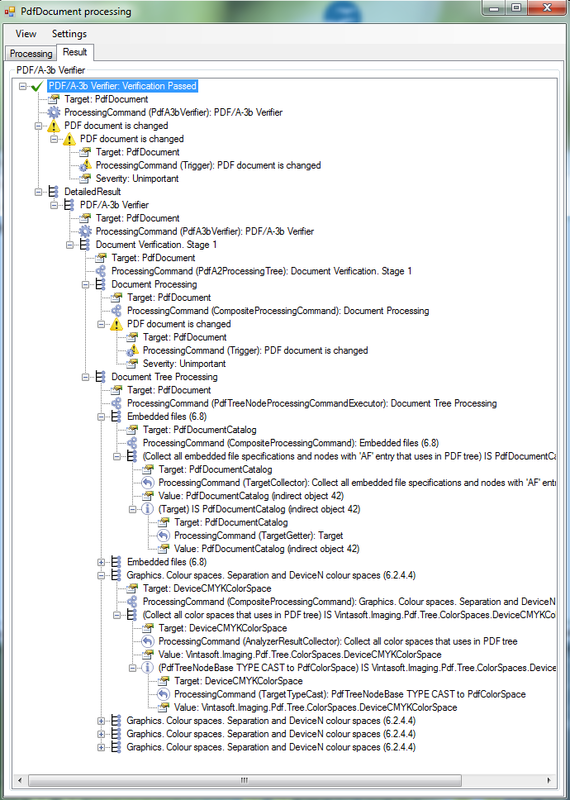 Fixed the bug in verifier and converter of PDF/A-1b documents. 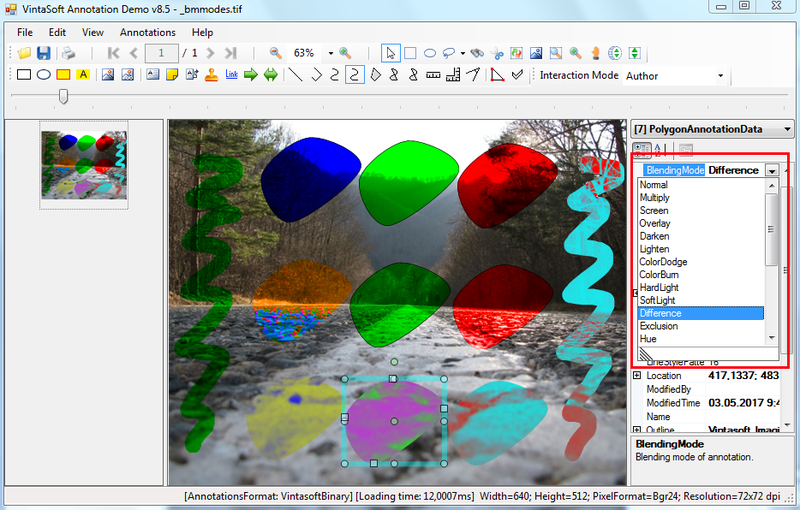 Fixed the bug in visual tool WpfPdfAnnotationTool in algorithm that selects several annotations and interactive fields. Added the blending support for WPF line-annotations with Cloud and Triangle line style. Version 8.5.3.1 of VintaSoft Imaging .NET SDK has been released. Minor improvements in web image viewers. Improved the algorithm that renders PDF interactive field with multiline text. 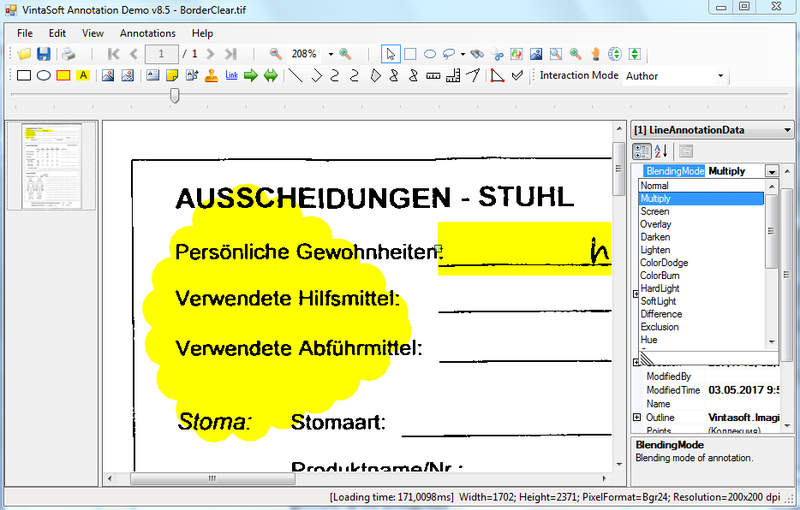 Now PDF interactive field allows to limit the font size for text, which size is calculated automatically. Added the ability to remove Image XObjects and Form XObjects from content of PDF page or PDF form. Now PDF renderer takes into account the PdfImageResource.Interpolate flag. Now PdfEditorDemo allows to use Ctrl+C/Ctrl+V shortcuts for copying/pasting text in text annotation and interactive fields. Version 8.5.4.1 of VintaSoft Imaging .NET SDK has been released. Fixed the bug in processing of 1-bpp or 4-bpp images, which appears in GetUniqueColorCommand class. Improved the rendering of PDF documents, which contain thin lines. Fixed the bug in rendering of text using ShadingPattern. Version 8.5.5.1 of VintaSoft Imaging .NET SDK has been released. Added the ability to decode palette TIFF images compressed with JPEG compression. Improved the algorithm that determines text encoding for TrueType fonts. Improved the algorithm that packs damaged PDF documents. Fixed the bug in PDF/A converter. Now it is possible to open PDF document, add digital certificate to the PDF document, convert PDF document to PDF/A format and save PDF document to a new file. Version 8.5.6.1 of VintaSoft Imaging .NET SDK has been released. Improved the XMP parser, which led to an improvement in the PDF/A verifier. Improved the TrueType font parser. Fixed the bug in parser of DICOM image metadata. Version 8.5.7.1 of VintaSoft Imaging .NET SDK has been released. Added the ability to define the mechanism of state storage for Undo/Redo function. For example, earlier there was the ability to store Undo/Redo state history for image in memory only, but now it can be also stored on disk. 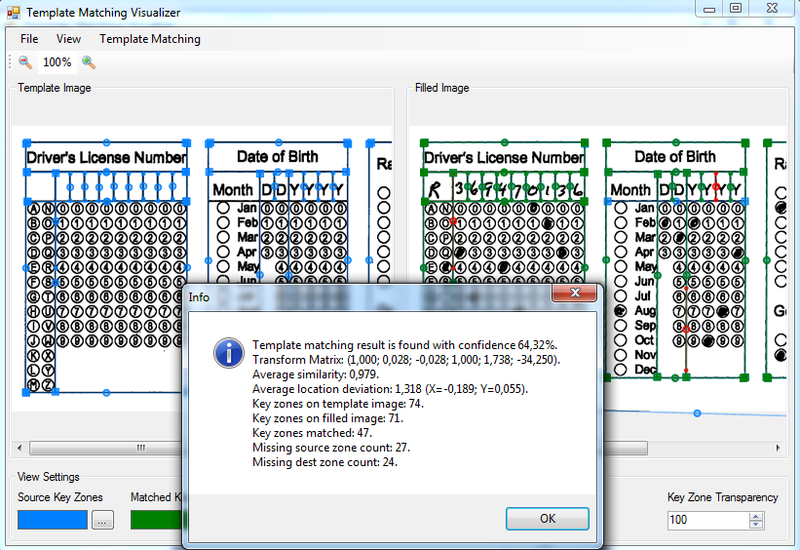 Fixed the bug in algorithm that draws image annotations in WinForms. The bug appeared since version 8.5.0.1. Improved the algorithm that rotates image with annotations in web. Fixed the bug in parser of TrueType fonts. 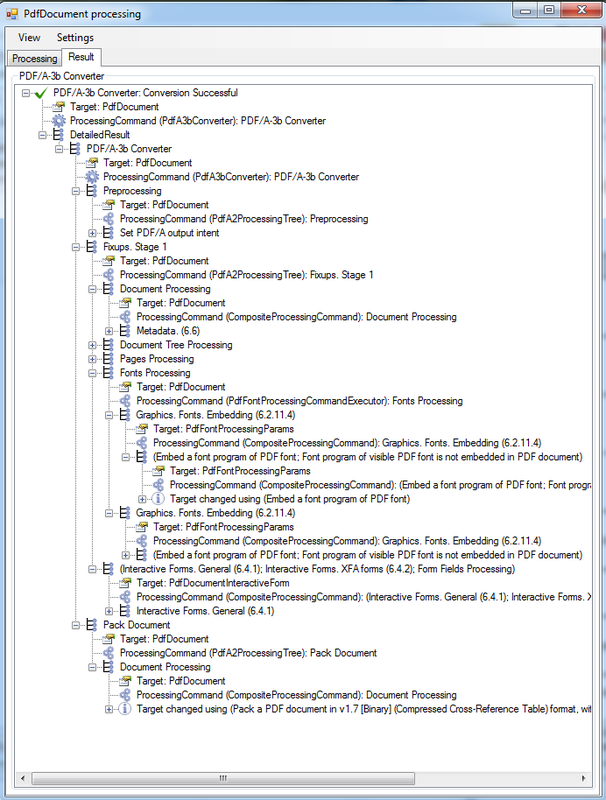 Fixed the bug in the DepthOfSaveGraphicsStateOperatorsGreaterThan28 trigger of PDF/A verifier. Fixed the bug in the GraphicsStateParametersHasNonStrokingAlphaConstant and GraphicsStateParametersHasStrokingAlphaConstant triggers of PDF/A verifier. Version 8.5.8.1 of VintaSoft Imaging .NET SDK has been released. Now visual tool WpfZoomTool can work with touch screen and allows to use 2 fingers for zooming an image in WPF image viewer. 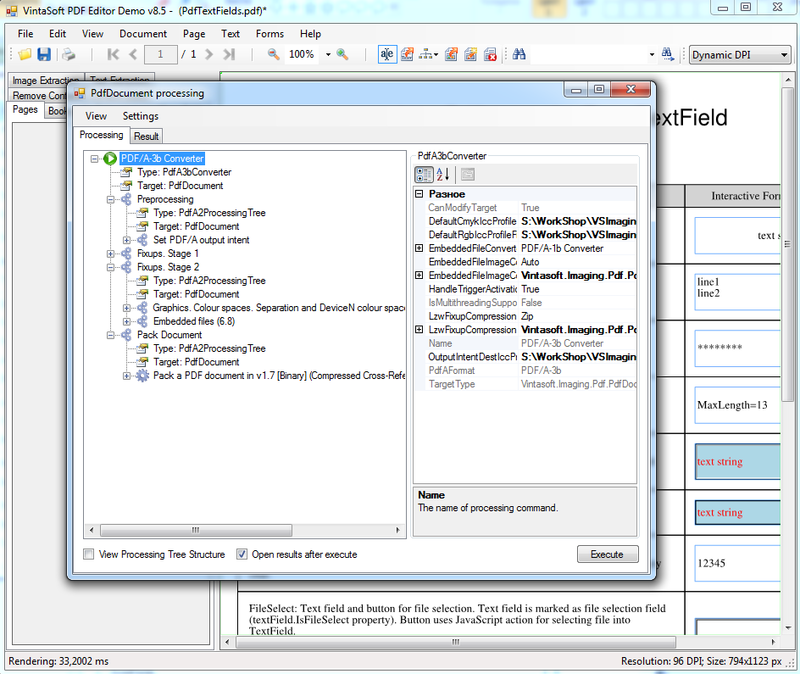 Now visual tool WpfPanTool can work with touch screen and allows to use finger for panning an image in WPF image viewer. Improved the background color detection in Rotate command for 32-bpp images. Added the ability to align multiline text in Stamp annotation. Fixed the memory leak in Embedded annotation. Fixed the bug in algorithm that renders PDF page, which have transparency stack. Version 8.5.10.1 of VintaSoft Imaging .NET SDK has been released. Fixed the bug in parser of Type1 fonts. 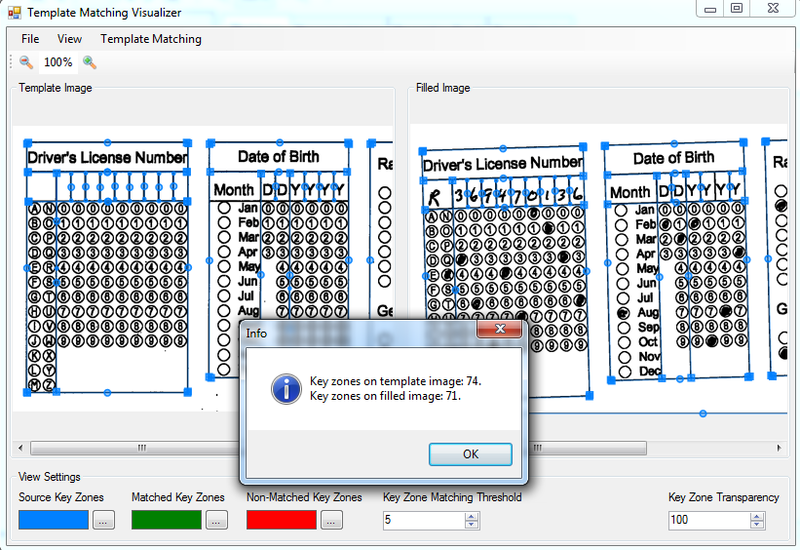 Added the ability to process form image before generating of image imprint. Added the ability to select the image imprint generator. Available generators: image imprint generator based on lines; image imprint generator based on L-patterns. Added the ability to change parameters of image imprint generator. Added the ability to process the form image before generating of image imprint. Also now it is possible to preview processed image in image viewer. Added the ability to view and compare imprints of template form image and filled form image. Added the ability to view the result of form identification, i.e. 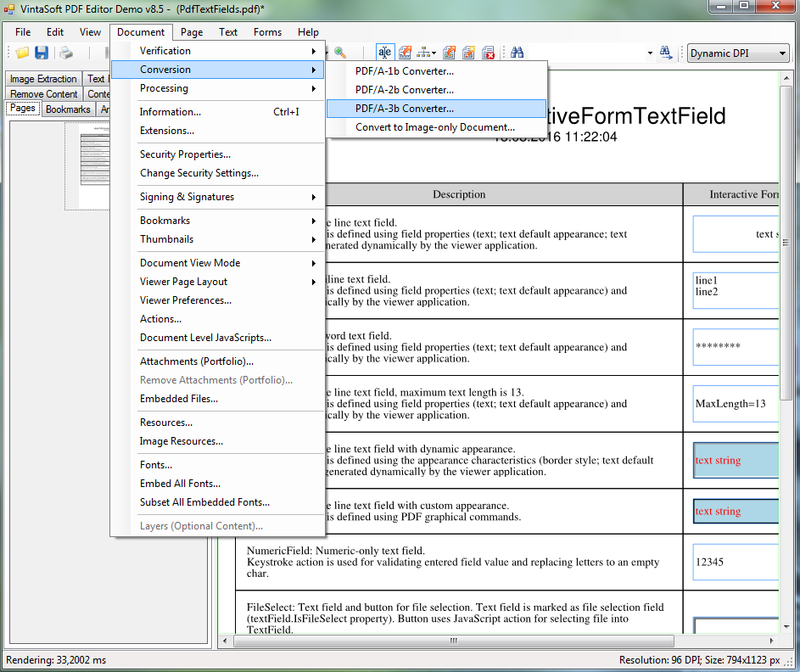 view and compare key zones of template form image and filled form image.